The new seven-seater Ford Grand C-MAX Diesel Estate is so Ford in many ways: It’s great fun to drive, practical and looks decent. However, a three-star safety rating is sure to alarm some buyers, while the economy claimed by Ford will be hard to achieve in real-world conditions. Still, as the bigger version of the already impressive standard C-MAX, it’s guaranteed to generate interest. If you’re interested in finding out more about Ford read our summary of their history here. 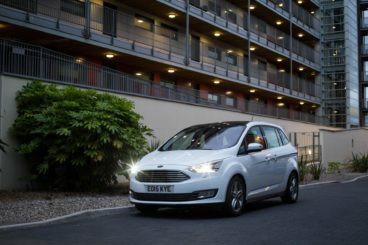 OSV takes a closer look at what it’s all about with our 2018 Ford Grand C-MAX Diesel Estate review. The Grand C-MAX is an impressive size. It’s not massive, but it certainly isn’t small either. Thanks to Ford’s engineering wizardry, however, it handles like a much smaller car. The agile and responsive steering is a huge plus, and the ride is a lot softer than last time. Body lean is remarkably well controlled for such a big car too, and despite a tall body, the Grand C-MAX is fairly agile. It’s probably the most entertaining car in this sector. Then there are the engines. They’re all strong, refined, quiet, and – according to Ford at least – super economical. There’s not a whole lot to choose from, with Ford offering a pair of TDCi diesels. These are smooth and will suit high mileage drivers, or anyone who’s planning to spend a lot of time out on the motorway. A 1.5-litre 118bhp diesel sits at the bottom of the range. It’s got a fair amount of pulling power despite its modest size, and because it’s the most frugal in the range, we expect it to be the best seller. A 0-62 time of 12.3 seconds will look too sluggish on paper for some buyers, though, but other than that, it’s hard to find fault with this engine. Your only alternative is the considerably bigger and more expensive 2.0-litre 148bhp diesel. This is a proper rugged workhorse – the exact type of engine that a car like the Grand C-MAX needs. It covers the 0-62 sprint in less than 10.0 seconds and has lots of pulling power in its tank. However, it’s on the costly side and isn’t as economical as the smaller diesel. Are Ford cars reliable? Read our unbiased assessment here. This is the seven-seater version of the smaller C-MAX, and extending its size to cope with the extra seats has meant that this bigger variant isn’t quite as attractively styled as its sibling. It’s not ugly by any means, but a higher roofline means it looks a bit more ungainly. Inside, it’s comfortable and – for the most part – quiet. Long journeys pass without any hassle, thanks to the cars soft suspension, and while there are more comfortable cars in this class, the Grand C-MAX doesn’t ever really become uncomfortable. It’s well-insulated too and does a good job of keeping out most engine, wind and road noises. The dashboard is a lot like the one found in the Ford Focus. It’s smartly put together, composed of top-notch materials, and the instrument layout is a lot less cluttered than its predecessor. Is the Ford Grand C-MAX Diesel Estate practical? It’s meant to be the more practical version of the standard C-MAX, and it kind of is. A high but comfortable driving position makes for good visibility and the car definitely has bigger dimensions than the C-MAX. However, that extra space is taken up by the extra third row of seats. Moreover, when all seven seats are up, the boot measures just 65-litres. Fold the third row of rear seats and it extends to a more respectable 448-litres. However, we’re nitpicking a little because this is a very practical car. The sliding rear doors are a massive plus, as are the ISOFIX child seat mounts. The second row, meanwhile, can offer plenty of room for adults. 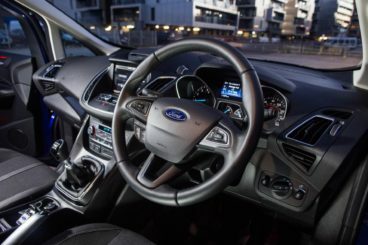 The Zetec is now the entry-level model and it comes with air conditioning, 16” alloys, a heated windscreen, Bluetooth and a digital radio. We feel that the Titanium model is the sweet spot in the range. It adds bigger alloys, cruise control, automatic lights and wipers, an auto-dimming rearview mirror, twin-zone climate control, the brand’s SYNC2 infotainment system and USB connectivity. The luxurious Titanium X model rounds things off with part-leather electric seats, bright xenon headlamps and a panoramic sunroof. Handy optional extras include a £280 Convenience Pack that comes with parking sensors and Ford’s Active Park assist system. We also like the look of the £550 Driver Assistance Pack that nets you traffic-sign recognition, a lane keeping aid and automatic lights and wipers. In terms of how safe the car is, the new Grand C-MAX scored a disappointing 3/5 when it was crash tested by Euro NCAP. This will worry some buyers, especially when its predecessor scored 5/5. The new car scored especially badly for Safety Assist, and true enough, if you want your car to come with advanced safety tech you’ll either need to avoid the Zetec model or pay extra for the optionals. Prices for the standard car start out from £23,540 and rise to as much as £29,780. For more information on our leasing deals, you can check out our page here. In terms of its running costs, the 1.5-litre 118bhp diesel is the most frugal. It can return 64.2mpg on a good day and emits just 113g/km of CO2. For such a big car, these are impressive numbers. However, if you fancy a bit more performance from your Grand C-MAX, the 2.0-litre 148bhp diesel is good for returns of 61.4mpg, which are very respectable. It emits 119g/km of CO2. Insurance-wise, the diesels range from groups 16 to 20. Not all cars in this class come with sliding rear doors, so it’s a massive bonus when they do. The middle seat folds away for easy access to the third row, and it’s clever touches like this that make the car so appealing. Because the Zetec is now the entry-level model, all models are well equipped. Keep all seven seats in place and the boot measures a paltry 65-litres. It looks okay but some will think it looks too ungainly. Let’s see how the car fares against its rivals in the comparison section of our 2018 Ford Grand C-MAX Diesel Estate review. The new Citroen Grand C4 Picasso is one of the most sharply styled cars in this sector, showing that cars like this don’t have to be so bland. On the other hand, the lack of sharpness on the handling front means that there’s a fair amount of body lean. On winding roads, its deficiencies are there to see, but if you drive sensibly the car can offer an enjoyable driving experience. In terms of its engines, the 1.6-litre 99bhp diesel sits at the bottom of the range, and it might be too small for some. It takes 12.8 seconds to complete the 0-62 dash. The 118bhp variant is more an attractive proposition, and it’s almost as cheap to run. It takes 11.3 seconds to get you from rest to 62mph and copes well with the car on a full load. Whichever you choose, both diesels are quiet and don’t need to be worked too hard. Rounding off the range is a more muscular 2.0-litre 148bhp diesel that covers the 0-62 dash in 9.6 seconds, but this one does need to be worked hard. Running costs? The smallest 99bhp diesel can return 74.3mpg, which is very impressive for such a big car, while the 118bhp variant is good for 70.6mpg. The biggest diesel is hardly what you’d called expensive to run, and can return 68.9mpg on a good day. Inside, the cabin is gorgeously designed. The large windows create an airy and light atmosphere and the car works well as a motorway cruiser. It’s a genuinely nice place to spend your time on the road. The space-age dashboard stands out in what’s usually a conservative sector, but we wish the controls were a bit more intuitive. Most of them are controlled using a seven-inch touchscreen that’s hard to get to grips with. 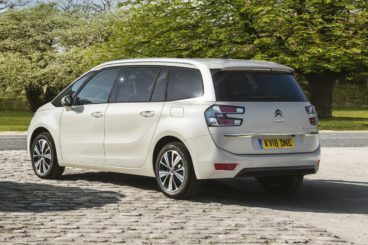 Is the Citroen Grand C4 Picasso practical? The dashboard itself comes with four storage areas, while the car can fit seven people at any one time. The glovebox is a bit on the small side, but there are plenty of other storage solutions, including a pair of hefty lidded storage areas. The middle row of seats is three individual chairs, legroom and headroom are good all-round, and the boot measures 165-litres with all the seats up. Fold the third row of seats and you can extend it to 632-litres. Fold the second row too, and you can increase it to 2,181-litres. 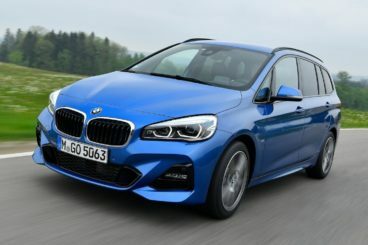 The new BMW 2 Series Gran Tourer is the premium alternative to the Ford. It’s impressively large and sports a very flexible cabin. Like the Grand C-MAX, the BMW is also good fun to drive. Its engines are taken from the MINI Cooper Hatchback, a car that’s always getting the party started, and they’ve lost none of their character despite the BMW being much bigger. Indeed, the car drives a lot faster than you’d think and it handles like a smaller car. It can’t corner with the same adroitness of a 3 Series, but there’s still a lot to like about the way it drives. In terms of its engines, the 1.5-litre diesel is probably going to be too small for most of you as it develops just 116bhp. It takes 11.4 seconds to cover the 0-62 dash. A 218d model that’s powered by a 2.0-litre diesel is a bigger bet, and it’s also not as loud as you’d expect. However, the 220d xDrive four-wheel-drive model grabs all the attention with its powerful, formidable grip, and its 0-62 time of 7.8 seconds. That said, those kinds of figures are probably unnecessary in a family car like this. Running costs? The 1.5-litre diesel might be underpowered but it can return 64.2mpg, which is remarkable for a car of this size. The 218d and 220d models, meanwhile, both return 61.4mpg, which is also impressive. Inside, the BMW is durable, stylish and on the whole well-appointed. Its excellent iDrive system is standard across the range and all the surfaces look and feel well-finished. Everything is of a high quality, and it’s this high quality and touches like the brushed metals that give the BMW the edge over the Ford. Is the BMW 2 Series Gran Tourer practical? It’s based on the smaller Active Tourer model but can offer larger dimensions. The second row of seats come with a handy tilt-and-slide function to make it easier to access the third row, while big rear doors are a bonus. The door bins and glovebox are a good size, and head and legroom are adequate. The seats are different sizes, though, and there are no ISOFIX child seat mounts in the middle seat. The boot, meanwhile, measures 145-litres with all seven seats up and extends to 560 when you opt for the third row. Fold all the rear seats and you can increase it to 1,820-litres. If you need a more practical, larger version of the C-MAX, the Grand C-MAX is well worth a test drive. It’s got what buyers want from cars like this: Seven seats, sliding rear doors, and strong but affordable engines. The Ford Grand C-MAX Diesel Estate is a lot cheaper than the even bigger S MAX, and many will see it as the sweet spot in the range.